These additional travel to Israel resources are here to help you see more of our country. Our website focuses on Jerusalem, but you may also want to discover more about other areas of Israel or about specific sites. We think you may find some of these websites useful in planning your journeys, whether it's to provide background information to make your trip more meaningful or to suggest unusual sites or activities in Jerusalem or Israel that we haven't yet mentioned elsewhere. For example, if you like hiking and archaeology, you'll find a host of unusual destinations, off-the-beaten path hikes and suggestions for day trips all over country on Ethan Bensinger's informative blog, Sightseeing in Israel. Follow his lead and he'll take you on any number of unusual adventures all over Israel that are bound to make your trip different from the rest. This-is-Galilee.com gives you an insider view of northern Israel - in particular, the beautiful Galilee. This area is the heartland of Jewish mysticism and Christian history. It's also a gorgeous area of verdant hills, mountains and springs that provide plentiful opportunities for hikes, day trips and spiritual replenishment. On this site, you will find tips for visitors and personal recommendations for where to stay, where to eat and what to see and do in one of Israel's most fascinating regions. Safed is one of our four holy cities, so don't miss it when you travel to Israel. Safed, also spelled Tzfat, is high up in Israel's verdant mountains. This was the home of some of Judaism's most famous mystics and scholars. At one time, it had a larger population than Jerusalem, which is hard to imagine when you amble through its tiny alleys today. 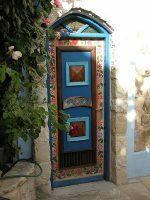 Now, it is mostly home to artists' studios and workshops and a draw for those looking for a little mysticism in their life. It it is picturesque, romantic and yes, mystical .... This site has photos and information on local attractions, museums and accommodations. Israel is a major birdwatcher's destination and even cities like Jerusalem have a migrant bird sanctuary. The main draw for birdwatchers are the fall and spring migrations in the Hula Valley. However, further south, Kibbut Lotan also provides lovely opportunities. The Kibbutz Lotan Center for Birdwatching site provides information on bird sightings, birdwatching tours and festivals for the amateur ornithologists among you who might be heading southward for a few days of fun Eilat holidays. 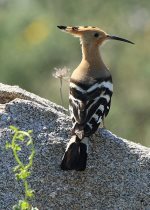 Photo of Hoopoe, Israel's national bird, by Arturo Nikolai, under a cc-by-2.0 license. Don't Miss What's New in Jerusalem! Stay up-to-date with all that's new in Jerusalem and on this site. Subscribe to the RSS feed at the top of the navigation bar over on the left and you won't miss a thing. And sign up for our free monthly newsletter to stay abreast of what's going on, as well as new discoveries, seasonal events, cool Jerusalem tours and exciting activities. Click here for the top 5 discount hotels in Jerusalem. This site participates in Amazon's Affiliate Program. As an Amazon Affiliate, we earn from qualifying purchases.